The aquatic resources of South Australia are owned by the Crown for the benefit of the South Australian community. The role of the South Australian Government, as custodian of these resources on behalf of the broader community and future generations, is to ensure that they are protected and used in an ecologically sustainable and economically efficient manner, while at the same time promoting optimum utilisation. The Government must also ensure that the basis for sharing resources among all user groups is clearly understood and accepted as equitable, and that the allocation of access to aquatic resources and their level of utilisation is consistent with the needs of present and future generations. Primary Industries and Regions South Australia (PIRSA) occasionally receives applications seeking permission to investigate the viability of new commercial fishing activities, including harvesting species not currently fished commercially and undertaking fishing activities in new areas. To facilitate the ongoing sustainable development of South Australia’s aquatic resources, Amendments to fishery regulations under the Fisheries Management Act 2007 (the Act) have been made to prescribe provisions to the issuing of permits for exploratory and developmental fishing activities. The issuing of permits under the new regulations will allow greater regulatory flexibility to support the development of new and emerging fisheries in South Australia. This will provide controlled access to the aquatic resources of the State in a manner that will foster ecological sustainability and optimum utilisation. This information should be read in conjunction with the Act and its subordinate legislation. the participation of users of the aquatic resources of the State, and of the community more generally, in the management of fisheries is to be encouraged. The Act also requires that the aquatic resources of the State be managed in an efficient and cost effective manner and that targets be set for the recovery of management costs. Under the Act, there are two types of permits available to manage potential new fishing activities. These are known as exploratory and developmental permits, and they may be issued for the taking of aquatic resources of the waters of the State that are not part of an existing fishery. ‘Explore and identify opportunities for the commercial exploitation of aquatic resources’. An exploratory permit is a mechanism for gathering preliminary data to assist in determining whether the commercial harvesting of a particular aquatic resource in a particular manner is sustainable and desirable. Exploratory fishing permits are not transferable so as to encourage exploratory fishing permit holders to actively explore the viability of the resource and avoid speculation in resource access. Exploratory permits may be issued for a maximum period of up to three years. ‘Enable a rigorous and detailed assessment of the potential commercial exploitation of aquatic resources, in order to demonstrate that it is economically viable, socially acceptable and ecologically sustainable’. A developmental fishery permit is a mechanism for gathering more substantial data to assist in determining whether the proposed fishing activity is sustainable and desirable. The information collected by the permit holder as a condition of the developmental permit must be reliable and meaningful and should facilitate decisions about the sustainability and desirability of developmental activities. In most cases, developmental activities will follow and expand activities undertaken in an exploratory phase. However, in some cases an application may proceed immediately to a developmental phase without first going through an exploratory phase. This may happen when the activities have previously been undertaken under a Ministerial exemption. Developmental fishing permits are transferable so as to provide permit holders with an additional degree of flexibility. It is recognised that during the developmental phase this flexibility is desirable to facilitate permit holders who may need to exit the fishery, while also providing them an opportunity to recoup some of the costs of their investment. Developmental permits will be issued for up to three years. The Fisheries Management Act 2007 requires fisheries to be managed in a cost effective manner, and that targets be set for the recovery of management costs. Consequently, there are a number of costs to applicants and permit holders associated with establishing or participating in exploratory or developmental fisheries. A non-refundable application fee is payable at the time of submitting an application for either an exploratory or developmental permit. This fee contributes to the cost of assessing the application, preparing the management regime, stakeholder consultation and the gathering of additional information. An exploratory permit fee is payable upon issue of an exploratory fishing permit and annually thereafter. This fee relates to the costs of managing the activities under the permit. Developmental permits are also subject to an annual permit fee. This fee will be determined under the Government’s Cost Recovery Policy for commercial fisheries on a case-by-case basis. When determining the applicable management and research fees, consideration will be given to the cost of managing the developmental fishery and the capacity of the applicant to contribute to the management costs on the basis of the proposed activities. These fees are outlined in the Fisheries Management (Fees) Regulations 2007. 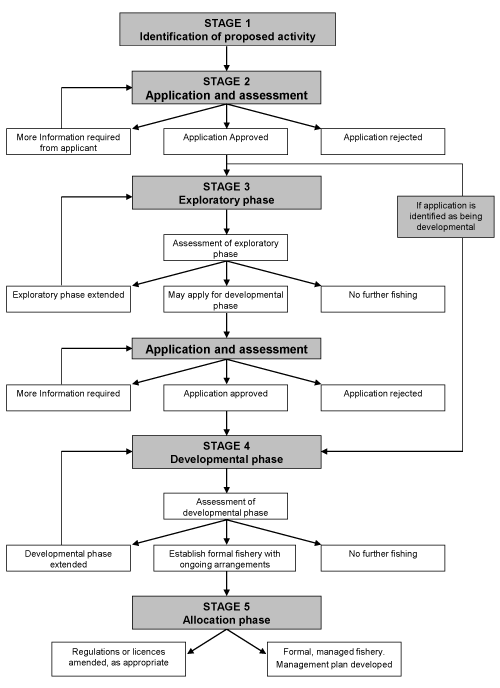 There are 5 main stages involved in undertaking exploratory or developmental fishing activities. An overview of these steps is provided in Figure 1. Applicants may identify an opportunity to undertake a fishing activity to take aquatic resources in the waters of the State that does not form part of an existing fishery. This may relate to the harvest of a species that is not currently fished commercially or from an area where an existing fishery does not extend. Alternately, the Minister (or his/her delegate) may call for expressions of interest to participate in a particular fishery. The application process is designed to allow all applications to be assessed fairly, and in accordance with the objects of the Act, as well as the precautionary principle and the principles of ESD. All applications, whether for an exploratory or developmental permit, undergo the same process, which involves the steps described in this section. People wishing to engage in exploratory or developmental fishing activities must submit an application to PIRSA, and pay the required application fee. An application form is attached to these guidelines (PDF 289.9 KB). Applicants need not specify whether they are applying for an exploratory permit or a developmental permit. PIRSA will determine which permit the application best fits into as part of the preliminary assessment. a business plan detailing proposed time and labour investment and demonstrating financial planning and preparedness to undertake the proposed fishing operation. If an applicant has participated in the exploratory phase of the relevant fishery, the details of this involvement may also be included as additional information. The opportunity to provide additional information is intended to allow applicants to demonstrate the ecological, economic and financial feasibility of the proposed activities and will greatly assist PIRSA to evaluate the application. Upon receipt, PIRSA will commence a preliminary assessment to determine whether the proposed activities fit within the objects of the Act, are exploratory or developmental in nature and whether the application should be formally assessed. If the proposed activities have not involved an exploratory phase, then they will most likely be exploratory. However, in some circumstances, an application may be considered developmental, even if exploratory activities have not been carried out. Consequently, a proposal may proceed directly from application to an assessment to undertake developmental activities. The applicant does not meet the fit and proper person test. The Minister (or his/her delegate) may determine the category (exploratory or developmental) into which the application fits, and then approve it to proceed to the next stage of assessment. Upon gaining this approval, PIRSA will commence any necessary public notification or consultation activities. The Minister (or his/her delegate) may request further information from the applicant. If there is insufficient information to make one of the above decisions then further information may be requested. If the applicant fails to provide further information, then the application may be rejected or progressed on the basis of the available information. Where the Minister (or his/her delegate) has refused an application during the preliminary assessment, the applicant will be provided with written reasons in support of the decision. Decisions made as a consequence of the preliminary assessment process are formal administrative decisions and are subject to the appeals provisions under sections 111 and 112 of the Act. All applications must undergo a period of public notification and stakeholder consultation prior to the formal assessment. The purpose of this process is to gain public and stakeholder comment on the proposed fishing activities. In particular, comment will be sought on the impact of activities on aquatic resources. Comment will not be sought on the proposed business activities. Under the provisions of the Native Title Act 1993, PIRSA must carry out a native title assessment before issuing a permit. Consequently, PIRSA may be required to provide the relevant native title parties with an opportunity to comment on permit applications. Public notices will be developed by PIRSA in consultation with the applicant, and must contain sufficient information about the proposal to facilitate informed responses and comments from interested third parties. During the public notification period, members of the public may submit written comments to PIRSA in relation to the application. PIRSA may distribute copies of the application or supporting material upon request, however, details of a commercial-in-confidence nature will not be released. At the conclusion of the public notification period, PIRSA will consider and review all submissions. If any of the submissions raise issues that are not dealt with sufficiently in the application or supporting documentation, then the further information may be requested. Where an application is considered for a developmental fishing permit following the conclusion of exploratory fishing activities, the review of the exploratory phase may also be taken into account. Following the formal assessment, the Minister (or his/her delegate) will make a decision in respect of the application, and notify the applicant of the outcome. If successful, an applicant may be issued with an exploratory or developmental fishing permit, which will contain the conditions with which the applicant must comply. Unsuccessful applicants will receive written notification and reasons supporting the decision. If an applicant is dissatisfied with the decision, an appeal may be brought under sections 111 and 112 of the Act. Permit holders may commence the proposed exploratory or developmental fishing activities upon receipt of their permit, and may continue until such time as the permit expires. Fishing activities will be subject to terms and conditions and applicants will be required to fulfill monitoring and reporting requirements as outlined below in section 6.2. At the conclusion of an exploratory or developmental phase, PIRSA will undertake a review of the activities (see section 5.4.2). Following this review, the Minister (or his/her delegate) may decide to extend the exploratory or developmental phase, bring activities to an end, or decide that the activities are suitable to continue under the next management stage. Anyone wishing to participate in a developmental phase subsequent to an exploratory phase must submit an application to PIRSA. Participants in the exploratory phase will have priority to continue their participation, should they choose to do so. Ongoing rights to carry out exploratory or developmental fishing activities are not guaranteed. Exploratory and developmental fishing permits may be issued for up to 3 years, at the discretion of the Minister (or his/her delegate). Once a permit has been issued for an exploratory or developmental fishery any subsequent permits issued for those activities may have the same expiry date as the original permit. This would provide a fixed end date for exploratory or developmental fishing activities, at which time PIRSA would undertake a final review and evaluation of those activities. The activities cannot progress to the next stage (undertaking the transition to the developmental phase, or to the allocation stage) prior to the review and evaluation report being completed. The review and evaluation report may be taken into consideration where a participant in an exploratory fishery applies for a developmental fishing permit in that fishery. Permit holders must carry out activities in accordance with the conditions of the permit, and must carry the permit while undertaking such activities. The Minister (or his/her delegate) may cancel a permit at any time if the conditions of the permit are breached, or if the permit holder commits any other offence under the Act. Exploratory or developmental fishing permits may also be re-issued at the discretion of the Minister (or his/her delegate). Once an exploratory or developmental fishing permit has been issued, the applicant is obliged to undertake the proposed activity. A record of all exploratory or developmental fishing permits issued will be entered on a public register at the time of a permit being issued, in accordance with section 116 of the Act. These guidelines make a distinction between those who have been involved in exploratory or developmental activities from their commencement (‘pioneers’) and those who have subsequently become participants. if an assessment is made at the developmental or allocation stages, that further permits should be made available. It is recognised that initial participants must be given the best possible opportunity to recoup their investment if an exploratory or developmental fishery progresses to be a managed commercial fishery. While ‘pioneers’ in an exploratory or developmental fishery are not guaranteed ‘rights’ to future access, the distinction between ‘pioneers’ and subsequent entrants will be reflected by allowing pioneers to have priority for participation in the next phase(s) of the fishery, should they wish to continue their participation. However, to be considered a ‘pioneer’ PIRSA must be satisfied that the permit holder actively fished the permit and complied with the permit conditions. Simply holding a permit is not sufficient to be accorded ‘pioneer’ status. Native title claimants who have entered Indigenous Land Use Agreements will also be considered in the process of allocating exploratory, developmental and ongoing fishing rights. At the end of the developmental or exploratory period, PIRSA will undertake a review and evaluation of the fishing activities. The objective of the review is to ensure that fisheries resources remain sustainable and to assist fishery managers, and participants, to determine whether the activities are suitable to move forward to the next stage. Before making a decision regarding the allocation of subsequent fishing activities, the Minister (or his/her delegate) may refer assessment of developmental activities to the Fisheries Council to assess whether it is appropriate for the fishing activities to be continued under formal management arrangements. the exploratory or developmental phase will be assessed as suitable to progress to the next phase. the allocation of resources between existing user groups. Management arrangements may involve changes to the relevant fisheries regulations to allow an activity to continue. The operation of this process will be determined on a case-by-case basis. In the process of allocating fishing authorities to facilitate developmental activities on an ongoing basis, pioneers will be given priority over subsequent participants. Native title claimants who have entered an Indigenous Land Use Agreement will be considered in this process. If it is determined that there are more participants than is deemed sustainable, the Minister (or his/her delegate) will consider how on-going access rights should be allocated. that other monitoring be undertaken (e.g. by an observer, or through the vessel monitoring system). In addition to the permit conditions, permit holders are required to conduct their operations in accordance with the Act. All exploratory and developmental fishing permits will be carefully monitored to ensure that activities are undertaken responsibly. This will involve mandatory reporting requirements, which will be included in permit conditions. Reporting and monitoring requirements will be developed in consultation with the applicant, and may vary according to the proposed activities, the species or gear involved, and the areas in which the activities will take place. collects and submits information on interactions with threatened, endangered, and protected species. 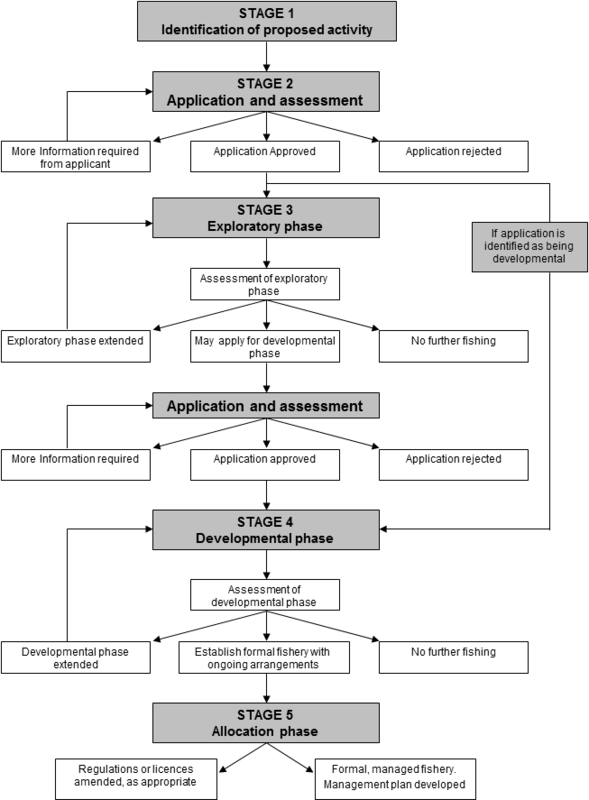 Information gathered through the reporting requirements will be used to assess the sustainability of activities undertaken in exploratory or developmental fisheries. The information may also be used to review and evaluate the fishery at the conclusion of the exploratory or developmental fishing period. Aggregated data from information gathered through reporting requirements, including summary catch and by-catch information, will be made available, subject to the confidentiality provisions of section 124 of the Act. PIRSA will determine, on a case-by-case basis whether or not, and how often, observers will be used to monitor exploratory or developmental fishing activities. In exercising this discretion, the Minister (or his/her delegate) will take into account the nature of the activities being undertaken, specific environmental issues, the proposed area of operation, and any other relevant information. Vessels used for exploratory or developmental fishing activities must be registered for commercial use with the Department of Planning, Transport and Infrastructure.